Graham Zusi and Sporting KC came close but couldn't top the Timbers. KANSAS CITY, Kan. — Timbers manager Giovanni Savarese wouldn’t divulge what was said in the Portland locker room at halftime Thursday night, saying only that “a few words” might have come across rather sharply. Sebastian Blanco got the rally started with his tying goal, and Valeri added the first of his two moments later. 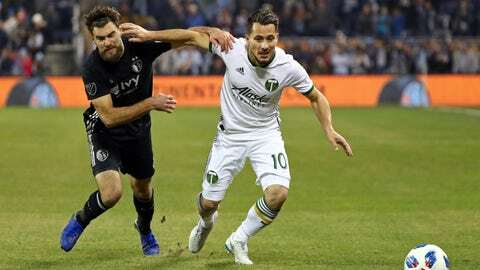 His second wasn’t even needed because the teams had played to a scoreless draw Sunday in Portland, and that meant the Timbers had the road-goal tiebreaker in the event of a 2-2 tie. Valeri’s stoppage goal merely allowed the Timbers to celebrate a few minutes early. Sporting KC had been 15-2-4 in home playoff games, their only losses coming in 1997 and 2011. Sporting KC also had been 12-2-5 at Children’s Mercy Park this season, losing just three times in 48 matches across all competitions in one of the toughest venues in all of Major League Soccer. The Timbers made it four defeats. Sporting KC actually controlled the game when Daniel Salloi found the back of the net in the opening minutes, much to the delight of a packed crowd at Children’s Mercy Park. Among them were a handful of Kansas City Chiefs, including Patrick Mahomes, Kareem Hunt and Travis Kelce. The strike in the 52nd minute was followed by Valeri’s header off a rebound moments later, a goal that not only silenced the crowd but led to a rather bizarre scene. Fans in one corner of the stadium began throwing bottles and other trash at Portland players, and referee Mark Geiger immediately brought both teams to the sideline. Vermes then stalked halfway across the field, waving his arms and admonishing his own club’s fans. Sporting KC was left needing two goals to win the game and advance, and nearly got on in the 72nd minute. Johnny Russell’s free kick from about 15 yards glanced off Felipe Gutierrez’s head and sailed over the net as Portland goalkeeper Jeff Attinella exhaled in relief. Fernandes finally got one of the goals Sporting KC needed, and the home crowd roared when it was announced that there would be nine minutes of stoppage time. But the Timbers managed to tamp down each attack by Sporting KC, allowing Savarese’s team to begin planning for Atlanta.